Published on November 11, 2012 in General T&T and Politics. 3 Comments Tags: Clico, Lawrence Duprey, Politics, T&T Govt. After building a billion-dollar insurance empire with tentacles throughout the region, former CL Financial chairman Lawrence Duprey claims he is now flat broke. “I am no billionaire. That is a lie. I don’t have a damn cent,” said Duprey during a telephone interview on Wednesday at his Florida, USA, home. Published on January 13, 2012 in General T&T, PNM and Politics. 5 Comments Tags: Andre Monteil, Clico, Karen Nunez-Tesheira, Lawrence Duprey, Politics. FORMER Finance Minister Karen Nunez-Tesheira yesterday for the first time revealed the personal reasons she had for taking her money out of the Clico Investment Bank (CIB) in December 2008, saying she did so in order to cut ties with Clico because her late husband Russell Tesheira – right up to his death in 2004 – had been badly treated by Clico and its former executive chairman Lawrence Duprey. Published on June 9, 2011 in Finance, General T&T, Law and Politics. 6 Comments Tags: Anand Ramlogan, Andre Monteil, Attorney General, CL Financial, Clico, DPP, Lawrence Duprey, Roger Gaspard. 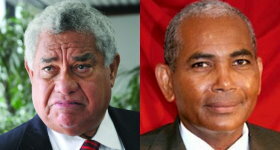 Attorney General Anand Ramlogan yesterday directed that all files coming out of the probe into the collapse of insurance giant CLICO be forwarded to Director of Public Prosecutions (DPP) Roger Gaspard to determine if criminal charges should be laid against former CL Financial executives Lawrence Duprey and Andre Monteil.